Classic & Gran Galà Series There are 4 products. Corbara’s Kitchen Wear: choose the advantages of the Tradizionale Jacket and the style of the Gran Galà series. 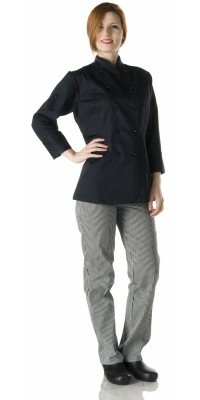 - the Gran Galà Chef Jacket, with matching stud buttons, is available in white for both the men's and women's model and in black only for the women's one. The Gran Galà Jacket is made of 50% cot. 50% pol. Comfort Satin Gabardine; this “cotton on the skin” fabric is very lightweight, breathable and at the same time resistant to washes. 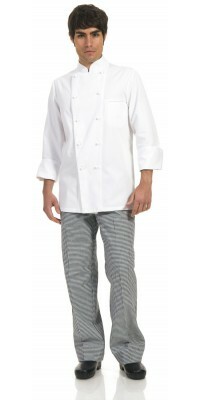 This garment, despite its simplicity, thanks to the premium fabric is suitable for the Sous-chef. Women's jacket, model Gran Gala'White colourWhite pull-out buttons Immediately available for delivery: sizes from S to XL Made of Comfort Satin, 50% Cot., 50% Pol. "cotton on the skin"
Women's jacket, model Gran Gala'Black colourBlack pull-out buttons Immediately available for delivery: sizes from S to XL Made of Comfort Satin, 50% Cot., 50% Pol. "cotton on the skin"
Jacket, model Gran Gala' pull-out buttonsWhite colourImmediately available for delivery: sizes from S to XL Made of Comfort Satin, 50% Cot., 50% Pol. "cotton on the skin"